Today’s tribute to David Letterman comes from an unabashed fan. Once this year I even made a one-day pilgrimage to “The City” (as we native New Yorkers call Manhattan) just to be in the audience. Yes, my husband and I traveled up from Virginia, where we joyfully waited in various lines, met other tourists who had traveled even more ridiculous distances than us. Altogether I felt like an oohey-gooey fan. Just to be part of “The Late Show with David Letterman.” Worth every dollar and every minute! David Letterman is a hero of mine for so many reasons: His wit, irreverence, intelligence, humanity. I have prized David Letterman’s ability to interview in a way that generates human interest (unlike the fawning style of celebrity self-involvement that has become far more prevalent on similar late-night talk shows). Even his “Stupid Pet Tricks” provided human interest, at least to this fan. Nevertheless, I’ll put all that aside as I research the who-you-be of David Letterman from these two contrasting periods in his life. I’m so curious how he has survived prolonged fame. Has he personally grown from the heart surgery, his one big scandal, fatherhood late in life? All of those very, very human details are public knowledge. Not so, the inner impact. If you’re curious too, keep reading this inside story as only Skilled Empath Merge can tell it. This aura research is gonna be all about using the skills, Blog-Buddies. The same skills any of you born empaths can use after you have learned enough to become a Master Empath. As for the rest of you, of course you can develop full energetic literacy and do detailed aura reading of anybody’s chakra databanks. Either in person or from a regular photo, your choice. Technical details about Skilled Empath Merge will be supplied at the end of this merge, including the photo links used for today’s labor of love. So go ahead and research Zany Dave, whether with Skilled Empath Merge or aura reading, before exploring a fun set of… human interest characteristics. If you push the definition of a physical object, where will that move a viewer? If you say this, how can that person be predicted to react? If you question that social thing everybody expects, what will happen? 80 feet. Although pre-retirement many jokes have been made about being old now, David Letterman doesn’t relate to life like a senior. He has, however, begun to feel middle aged. Beyond the many ways that life has personally weighed him down, so much pain has become part of his daily experience due to work-related STUFF. When I researched this chakra databank, Blog-Buddies, I had quite the head-slapper moment. Show business can be so very ugly. And of course David Letterman has seen it all. Take the tragedy of Lindsay Lohan’s life — that adorable, talented young beauty who has found herself trapped in hell. I’ve seen him interview her at least once. Then heard him joke about her in later shows, during his monologue. Celebrities show us the greatest possible glamour. I’ve read the aura of one celebrity at a time, sometimes doing comparison aura reading research or Skilled Empath Merges. In my awareness, up until writing this part of today’s article, I kept them all compartmentalized. In this Root Chakra Databank of David Letterman’s — and surely many other chakra databanks as well — no compartmentalization is possible. It’s as though all my neighbors here in Sterling, Virgina, had gone through larger-than-life adventures. So many of them tragic. And the cumulative weight on that can create a kind of sociological depression that I never had the opportunity, personally, to consider before. Making millions laugh can be grim work. Bringing laughter for decades, grimmer still. But heaviest of all is the hidden, denied misery of the performing world. Oh the heartache and disillusionment! 47 feet. The man is already fully formed as a curmudgeon. This chakra databank shows him rebellious. Often frustrated. Easily bored. Annoyed by stupidity, with stupidity being a major category among David Letterman’s behavioral collections in everyday life. Poking fun at regular things, taken for granted, impels his speech and actions. This eases his personal frustrations and helps him to relax. Putting himself or other people in confusing situations related to problems — David Letterman enjoys inducing the squirm factor. So often uncomfortable and BORED in everyday life, he adores inducing minor discomfort in others. “Can we please just break all this monotony?” could be the man’s slogan. 15 feet. Stale as eating cardboard. David Letterman has the instincts, the attention, the timing… all the skills. He’s so incomparably brilliant, technically. Yet there is nothing new to do. At this chakra databank, David Letterman carries a despondency in this moment. Nothing new! Nothing more to discover! Sure he performs, and others will not notice. That’s what makes his predicament so existentially frightening. He feels nothing now. Yet the audience laughs. Doing his show right now is like winding up a toy that makes a lot of noise, full of sound and funny. Signifying nothing. 4 feet. At this point in his life, David Letterman carries enormous anger. Yet he seeks to be a moral man, a good man. During the period of this photograph, David Letterman has one main solution to this internal conflict. He bottles it up, denies, and plays around with humor to defuse the edges of all his abundant annoyance. 18 feet. Tough, a bit calloused in texture, in my experience. By now David Letterman carries more clout than most mortals. If he says “Jump,” most people will jump. For instance, he gets way more respect than President Obama. In general. Yet David Letterman takes no joy in handling conflict. He still doesn’t like it. Setting up minor conflicts, through humor, interests him. Not handling the messy everyday problems. 6 inches. Ooh, scary, those feelings of his. Toxic probably. At this time in his life David Letterman is a scoffer. Not a gusher. Emotional responses to life are pushed far into denial, whenever possible. As for purposely doing things to grow emotionally — like Energy Spirituality? Horror, revulsion… and skepticism! 40 feet. By now David Letterman does relish emotional growth. Especially emotional honesty. Especially the kind of emotional growth that can happen outside the world of celebrity interviews and public life. It’s as though he has developed an allergy to celebrities. Much as he loves many of them. Enough already! Fills the room plus four inches. David Letterman doesn’t really let himself laugh inside until audience members have started to enjoy themselves audibly. Then he allows himself a split second of bliss before he returns to the usual: Applying his highly analytical mind to the business of creating laughter. 40 miles. Vibrantly funny. David Letterman is great at getting a response. Inwardly he doesn’t receive the humor. Specifically he doesn’t receive laughter or joy from humor that has been fabricated by a humor professional, himself as a comedian, anyone as a comedian. By now David Letterman wants to laugh with his son Harry. Or anyone else who is not a celebrity and can innocently discover authentic humor in life. 14 feet. Ruggedly persisting through everyday struggles, David Letterman is pragmatic about life. He ridicules pretentious people and loves to skewer anyone who pretends to be holier than thou. However, religion is a pesky and painful for him personally. Deeply moral, David Letterman shows his highest values through action… whenever he can. And otherwise tries not to think about lofty topics at all. Out to the moon. David Letterman is growing a lot now, spiritually. Authentic experience of what is. Inward awakeness while in the waking state of consciousness: This is progressing for him. He is letting go the need to take on the burden of making life funny for others. Or for himself. 80 feet. Doing what pleases him: This is by far the strongest, most vigorous chakra databank that I have read so far in David Letterman’s aura at this time in his life. He loves what is gross. He loves shocking people. He adores defying convention. Briefly making his audience uncomfortable brings a special delight to David Letterman. You know how, in adolescence, some guys decide to become Bad Boys? This is David Letterman’s version. And by this time in his career, it is becoming evident to the comedian that he can earn a living by being exactly his favorite kind of Bad Boy. Woo-hoo! 90 miles. Solid gold, at the time of this aura picture. David Letterman is back to playing the game of comedian and expert talk show host. He is playing it as someone who has, inwardly, already said farewell. That makes the experience new for him again. And so much dearer. David Letterman aura photos are just one click away. Since, to any aura reader or skilled empath, every photo is an aura photo. 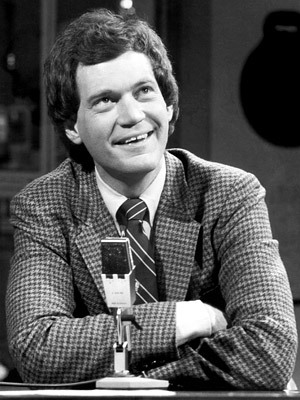 David Letterman aura picture from 1982. David Letterman aura picture from May 2015. These come from one of the Top 10 articles about David Letterman that I especially enjoyed. Skilled Empath Merge and depth aura reading are so important for Rosetree Energy Spirituality. Just as mathematics is the language of science, so is energetic literacy the basis of mind-body-spirit techniques — whether for aura healing or personal growth, and even making rapid progress on one’s path to Enlightenment. Reading the size and quality of any chakra databank  aura information at the astral or psychic or subconscious mind-level. Here is a useful resource for learning more about aura reading — how it doesn’t have to be psychic development when taught as a form of energetic literacy, our Top 10 List about Energetic Literacy. And here is a Top 10 List for becoming a Skilled Empath. In honor of Mr. Top 10 Lists, DAAAAAAAAAAAAAAAAVID LETTERMAN! The photo (and aura photo_ at the top of today’s article was taken by SSGT REYNALDO RAMON, USAF [Public domain], via Wikimedia Commons. Thanks for doing this reading, Rose. I’m a David Letterman fan, too, and really enjoyed watching the final show. What you shared meshes well with the tone of the farewell show. No wonder he wasn’t weepy. Seems that he has been ready to go. I also have always enjoyed his interviews. More and more, they seemed to be interesting, thoughtful conversations, thought always with plenty of wit. Thanks Rose. I haven’t watched his show in a long time, but I love David Letterman. What a loveable curmudgeon he is. This was thoroughly enjoyable to read. To see how he’s changed in relation to humor and making people laugh. For me, this was one of those statements that was shocking, then so obviously true. Thank you, Rose. This one was especially interesting. Can Other People's Cults Hurt You? More about Psychic Coercion.